Clang! Clang! Clang! The fire truck is pulling out of the station. But wait! Where is the firefighter going? To the potty! 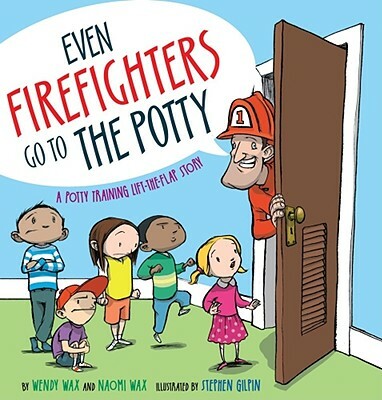 Even firefighters go to the potty! Toddlers are uneasy about toilet training. And in most cases, even if they know they have to go, sometimes they are too busy to bother. In this hilarious gate-fold story, each person--from a firefighter on the way to answer a fire alarm to a zoo keeper on the way to feed the polar bears--stops what they are doing to go to the potty. With humor and no pedantics, toddlers learn that everybody uses the potty. Wendy Wax has written many children’s books, including City Witch, Country Switch; Even Firefighters Go to the Potty; Clara the Klutz; Bus to Booville; and Even Princesses Go to the Potty. Wendy is also an editor and collage artist. Naomi Wax has taught creative writing in after-school programs at the Fieldston and Ethical Culture Schools. She is co author of Cool Women: the Thinking Girl’s Guide to the Hippest Women in History, which was adapted for the WE Network by Debbie Allen. She lives in New York City. Stephen Gilpin graduated from the NYC School of Visual Arts where he studied painting and cartooning. He is the illustrator of the Who Shrunk Daniel Funk series and The Extraordinary Adventures of Ordinary Boy series. Stephen currently lives in Hiawatha, Kansas. Visit him at SGilpin.com.